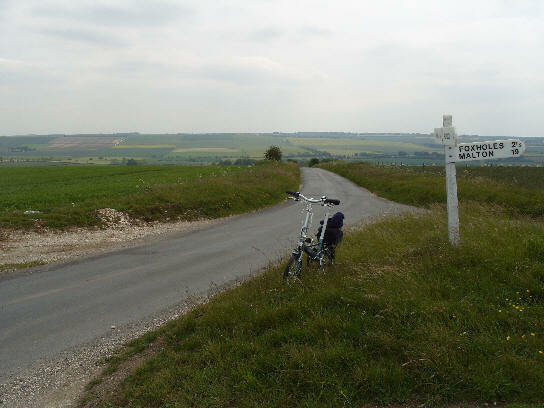 Big Skies Bike Rides is the name given to eight cycle loop rides 'launched' in 2010. They take their name from the phrase used by David Hockney when he compared the sky over the Yorkshire Wolds to 'the big sky' he experienced in the American West. 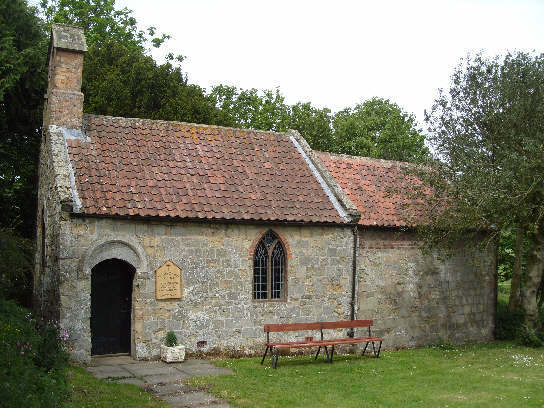 This 21.1-mile route starts in Hunmanby and passes through Thwing and Fordon, with a short-cut option through Wold Newton. 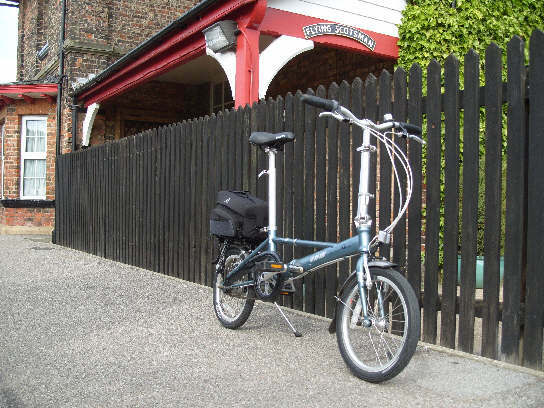 This was my sixth Big Skies Bike Ride, but also a first for me: yesterday I took my folding bike on Northern Rail’s Yorkshire Coast Railway line. 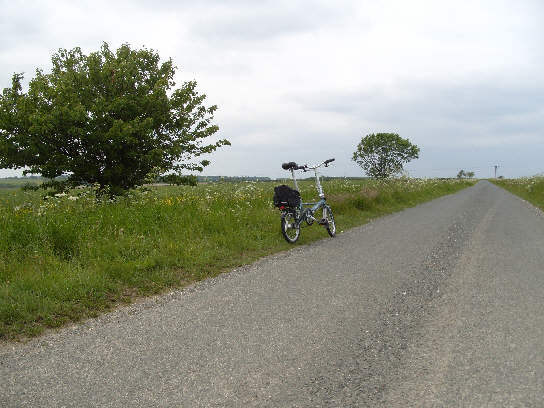 I thought I would take the prescribed short-cut on this route through Wold Newton as I had already ridden a considerable part of this ride (points 8 to 11 on the detailed map provided) a few weeks earlier. After I took the bike off the train I got my bearings and cycled over the track in to Hunmanby for a quick look at the village before starting the route proper. 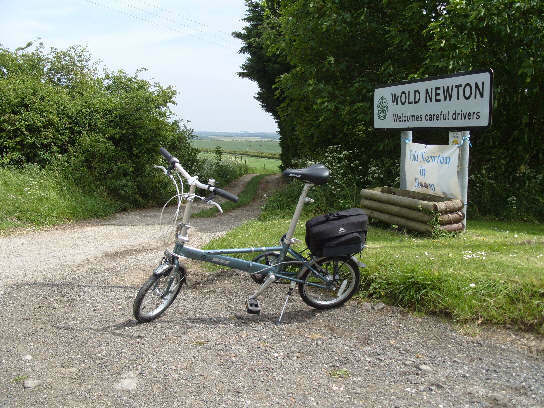 The little wheels on my Dahon Piccolo took some turning on the first few miles of the route that rose gradually uphill. For the six miles between Burton Fleming and my approach to Wold Newton I only saw farm vehicles (and parked cars outside people's homes) along the quiet country lanes. I had planned to get an earlier train, but didn’t manage to get away until midday. 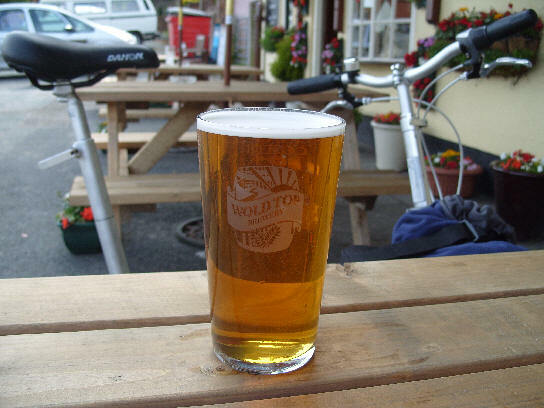 It seemed rude not to call in to the Falling Stone, a pub in Thwing that I understand sells Wold Top beer. I’ve only sampled the bottled variety, so I fancied a cheeky taste of the beer on draught. Unfortunately, the pub was shut, and wouldn’t open until later in the day. At this first high point I moved a little further on to avoid the flies drawn to the body of a dead black cat at the roadside. Poor thing. A chap driving a tractor gave a friendly gesture to let me know my bike was obstructing the way for him to drive in to a little clearing in the field to dump some thing or other. Later, when I hesitated before taking the correct route to Wold Newton, the same chap offered his assistance before I moved on. That was nice. There is only one OS chevron on this route. Just as I approached it I had a moment’s lapse in concentration. Perhaps it was the thought of food in Wold Newton, maybe something to do with that black cat, or the distraction of the pleasant view (which I didn’t quite manage to do justice to – it’s that picture at the top of this post). 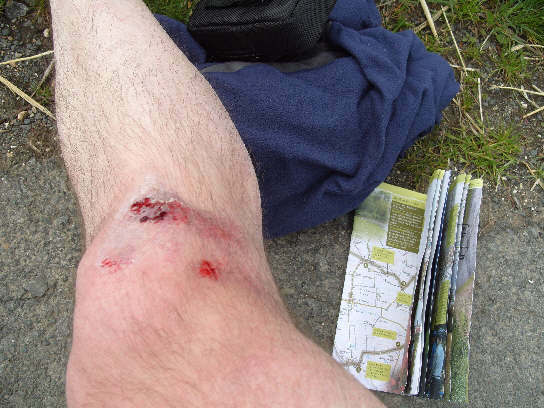 Whatever the reason I found myself crumbling towards the tarmac – in that slow motion sort of way that the body seems to adopt in order to deal with moments of stress – as the front wheel collapsed beneath me. I was beginning to regret not taking anything to eat or drink, but at least there was the possibility of refreshments in Wold Newton. The OS-adapted map showed the letters PH and I found the pub beside a small village pond. Unfortunately, the pub was shut, and wouldn’t open until later in the day. 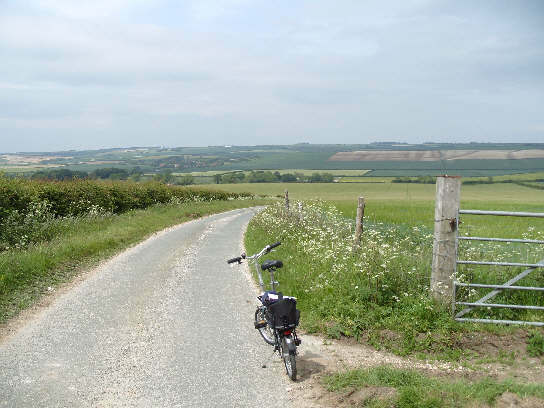 The gentle climb north out of Wold Newton led to one of the higher points on this route. There was a better view to be had, but there was a car parked in a viewing area that was in the way. Like its church, Fordon is not a large place (and there’s no pub). After leaving the church I turned right at the crossroads and cycled through Cans Dale – a sort of less impressive version of Thixendale or Millington Dale. At the end of Cans Dale there is a crossroads. Straight ahead leads to Burton Fleming, and right takes you back to Wold Newton. I turned left on to what felt as though it could be a busy road. There were a few cars – they gave me a wide berth – but it wasn’t too bad. This lumpy road eventually drops back in to Hunmanby. At the roundabout take a left turn to the shops, cafes and pubs. Wold Gold. Worth the wait. “Not a session beer” according to the landlord of this pub in Hunmanby. Sadly, I missed the 15.13 back to Hull so had to wait another hour and a half for the next train. What to do…? Despite the pain of multiple grazes (knee, hip, elbow and shoulder), sore ribs, sun burn and hunger pangs, this was a very enjoyable outing. Admittedly, part of the appeal was the idea of taking the train to the starting point of this Big Skies Bike Ride for a bit of a change. 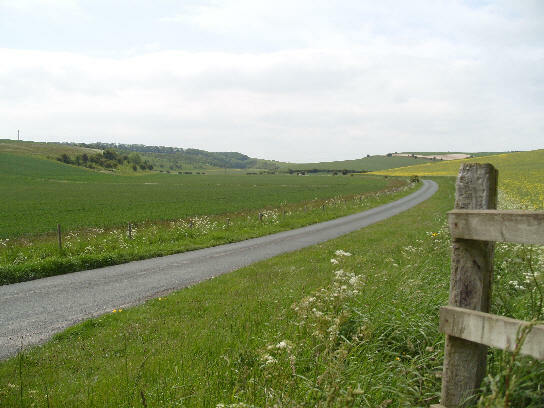 But of greater satisfaction are the near-empty roads over gently undulating hills around the villages in this northeast area of the Yorkshire Wolds. Apart from the cars on the mile or so of road before Wold Newton, and the delivery vehicles along Cans Dale, these country lanes were very, very quiet. Perfect cycling roads. Man caught surfboarding on a bicycle in Hull Paragon Station. Okay, it’s the Philip Larkin statue commissioned to celebrate the area’s most famous misanthropic librarian poet. Except this being Hull someone stole his spectacles days after the piece was unveiled. 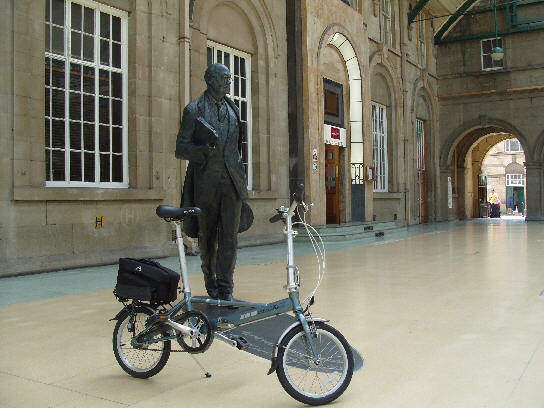 Part of the appeal of doing this Big Skies Bike Ride was to travel there by train and take my Dahon Piccolo for a fun little ride. The return ticket cost me £12.50. I nearly missed the train (my watch is slow) and had less than a minute to get on board. The conductor told me to take the second carriage, presumably because there is space for stashing two bikes. However, my little bike folds fairly small and can fit in to the luggage compartment between the passenger seats. 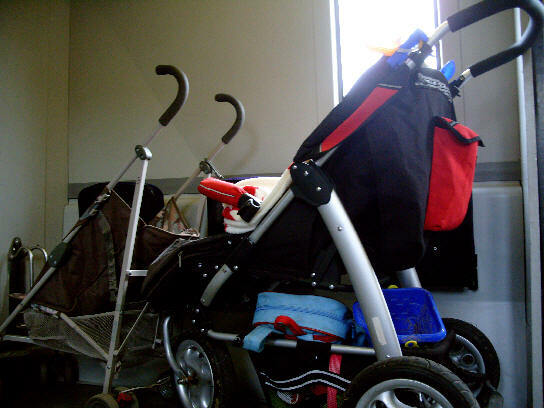 Because I was still folding it when the train moved off I sat with my fold-up bike on a fold-down chair opposite the prams that occupied the cycle racks. At Bridlington four cyclists got on – three women and one chap – and between us we shuffled the remaining pram, my bike and theirs to more than fill the space set aside for just two cycles. This was part of the reason why I took my folding bike. Hull is a terminal station, so (if you can be on time) it should be a straightforward first-come first-affair for the two available places. However, what happens when, after you’ve done your ride, you try to get on a return train and it’s already packed with other cycles? If I had got on in Hull with one of my regular bikes what would have happened if the four cyclists at Bridlington hadn’t managed to squeeze their bikes on to the train? The conductor was unfazed about having twice as many bikes on the train as there should have been, and didn’t make a fuss. The foursome were making their way back to Lancaster (I think) after completing the Way of the Roses cycle route. They could easily have been refused entry, or forced to go on separate trains, which wouldn’t have been much fun. Take a tip: take a folder. Posted by Chris on June 2nd, 2011. Lovely ride out Chris. YOu had sunshine too! Nice folding bikie too. 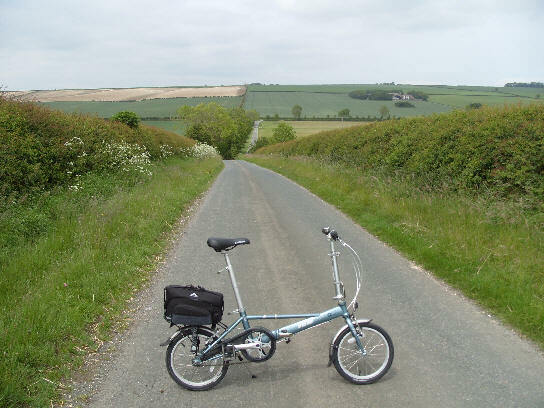 Ive never been on a folder, little wheels on big hills can make for tough cycling, but I expect they are ideal for the Wolds. When I cycled out there with Tina, it was 'Wold this, and Wold that' houses were called SUnshine WOld Cottage etc. It seems the term 'Wold' is quite old and means undulating landscape. Its a lovely part of England, I intend to return at some point and have another go on some of those roads. 'Ouch' with your sore knees and ribs by the way. I expect the small front wheel of the folding bikie would be less stable than a full sized wheel, and that is why you ended up polishing the tarmac with your knee. Ouch! We had a train incident in Romania with our bikes, which resulted in paying an exhorbitant fee to the conductor and his sidekick as they shook their heads sadly from side to side and nodded knowingly at each other. They put us in a private first class compartment and lashed the bikes across the ceiling using the window curtains as tie-downs. Very creative. There's a joke somewhere in wold, gold and fold, but I can't put my finger on it at the moment. Yes, the 16" wheels do make for tough climbing and twitchy handling – especially when the brakes grab rather than provide progressive pressure. My ribs are still sore, by the way. John Woodcock wrote: A couple of miles on [from Thixendale] you start pedalling back to Malton. That is you would if you were of Tour de France standard. 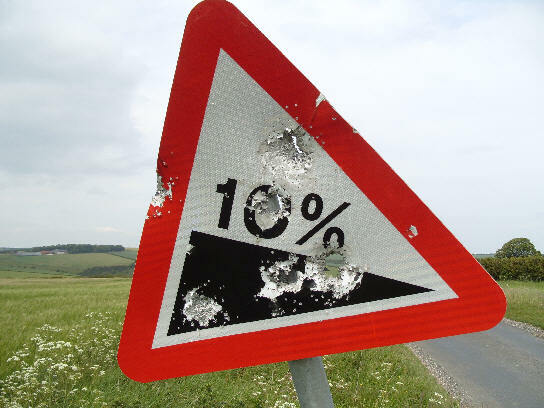 At this point most average cyclists will have to dismount and push the bike up to the plateau above the remains of the medieval village of Wharram Percy. I've done that route, and I wouldn't have managed it on my little Dahon. I know you wouldn't have a problem with this brief climb, Mary, but it's just another reminder that the Wolds are far from flat. I've a Moulton APB which lives in Spain now. I've toured on it. Great touring bike, but gears a little high for really steep stuff and they are twitchy. You could not cycle it hands off the bars. Small wheel bikes are like that. The APB has 20" wheels. Very handy for trains, taxis etc.